When Breath Becomes Air is an incredible, honest book. Written in the face of cancer by a man who happened to have spent the better part of his life trying to gain an understanding of death, the book has the urgency of a story that needs to be told. 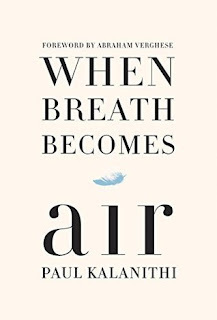 There is no scope for pretences, there are no airs and, perhaps, Kalanithi held only a vague awareness of a reader in mind, and little concern for the impression the book would have on a prospective reader. Its authenticity is its driving force, which is a rare quality for memoirs. I sometimes feel like my childhood was a montage of medicine names and hospital tales. I grew up around doctors and hospitals and what was most interesting to me about this book was how so many of Paul's experiences with and views on medicine paralleled my father's. The book felt very personal. When Breath Becomes Air offers an insider's view on medicine, as a profession, as a calling, as something that exists on the slippery slope of morality. It gives a glimpse of the doctor's view that we often fail to consider. Medicine, the hard reality of a doctor's life, requires you to suspend the values you have internalised - of what is right and wrong, what is permissible and what is just, and most significantly, what is possible. Kalanithi writes, delicately, about music blasting in the operation room, about dissecting cadavers in med school and about each time that a doctor has to tell a family that he is sorry he could not help. When Breath Becomes Air is not about cancer. It is written by a man dying of lung cancer, yes. It is most definitely about death, or about life, which is rather the same. But it is not about struggling against the disease. It is not the glorification of a short life, it is not about making the most of your time left, it is no 'Tuesdays with Morrie' (as my sister put it) and while there is nothing wrong with being any of these, I appreciated that the book was written not because the man had cancer but because he wanted to be a writer. His diagnosis only sealed the chosen fate. This book has a lot going for it. The biggest reason it appealed to me is for how it has planted this narrative in my head - this internal argument that forced Kalanithi to write the book. Have you read Because I could not stop for Death by Emily Dickinson? It is about the constant presence of death in the carriage of life. 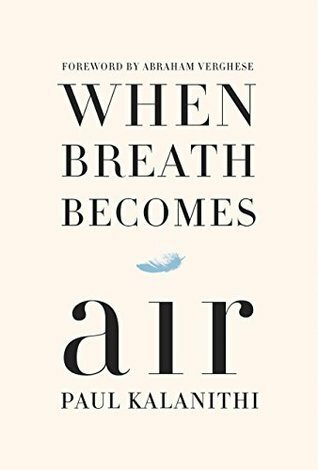 There is a persistent awareness of mortality in us, that Kalanithi suggests is what being human entails, be it in the form of loss or disease. What then, taking into account the inevitability of death, constitutes a meaningful life? A brilliant young man, in his final hour, muses on how to live. When Breath Becomes Air lies on a fascinating intersection of Literature (with an L) and science. Kalanithi writes at length about studying literature with the aim to untangle the complexities of the mind and later, almost dissatisfied with the limits of literature, majoring in neuroscience to analyse the brain and its role in making life meaningful. He flutters between the two, building a life around the practice of science in the best of times, seeking comfort in Samuel Beckett in the worst. He writes about where the two meet, philosophy and science, their intersection. This book is about what literature and science offer and what they lack, explained by a man who intimately knows and loves both. The book is also about family. About the fate of relationships and ties in life and death. Even as I write this, I wonder how a slip of a book was so many things... and this particular aspect of it, I don't want to spoil with my words. I leave this for you to explore and experience. Terry Pratchett wrote, 'no one is actually dead until the ripples they cause in the world die away.' Paul Kalanithi has left us with a stormy ocean. Do read the book. Keri Smith was my favourite illustrator, back when I used to know enough illustrators to have a favourite. Her blog, The Wish Jar, is one of the most interesting things on the internet. Tall claim, but trust me. Keri Smith has written a number of activity books for adults. Wreck This Journal, published way back in 2007, is an attempt to get the journal-er to embrace chaos and messiness. Each page has an innovative instruction to effectively wreck the journal - spill coffee! drag it across the floor! colour outside the lines! use makeshift brushes! - exercises to unleash the inner child. So far, my singular aim has been to not let any page set the tone for the rest of the journal. 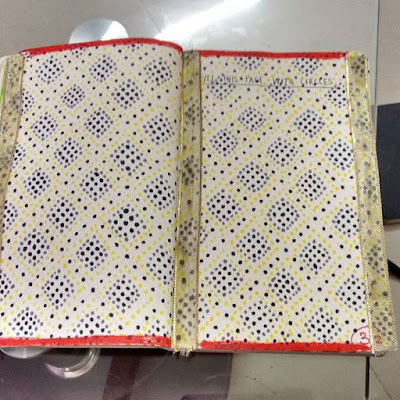 Many of the Youtube videos of completed Wreck This Journals have pages and pages completed in a style peculiar to that journal-writer. And while the result is often beautiful, it's not chaotic enough. I want to surprise and myself every time. And so some pages of my journal end up quite lackluster while others are more vivid than ever. Here are four favourites pages, each very different from each other. The first is inspired from Buddhist mandalas, though I am not sure I possess the skill required for the intricate detailing they demand. The second, apart from a base wash of green, is made entirely using toothpicks dipped in flowy and thick poster colour. 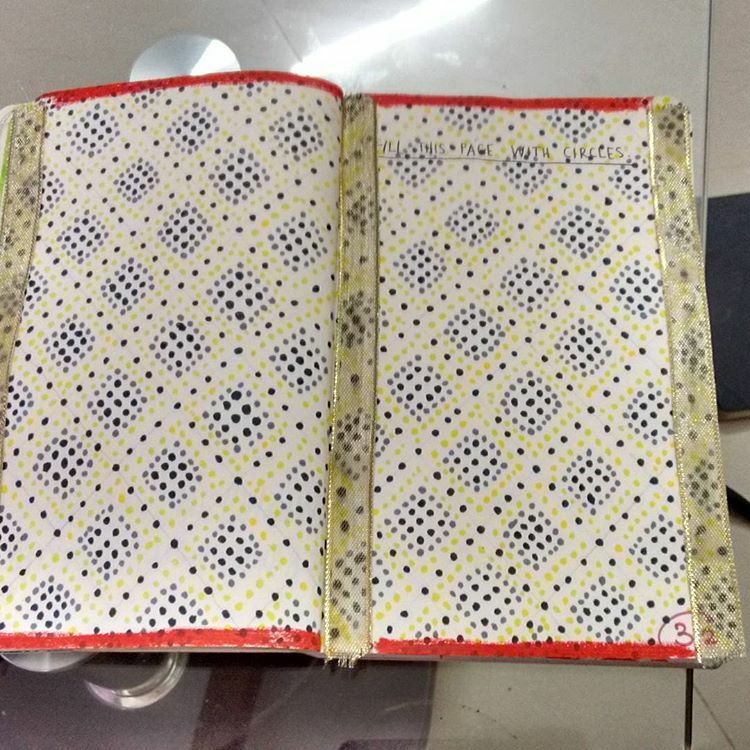 The third design is borrowed from my favourite pair of chappals - the prompt was to cover the page in circles - and required a great deal of patience too. 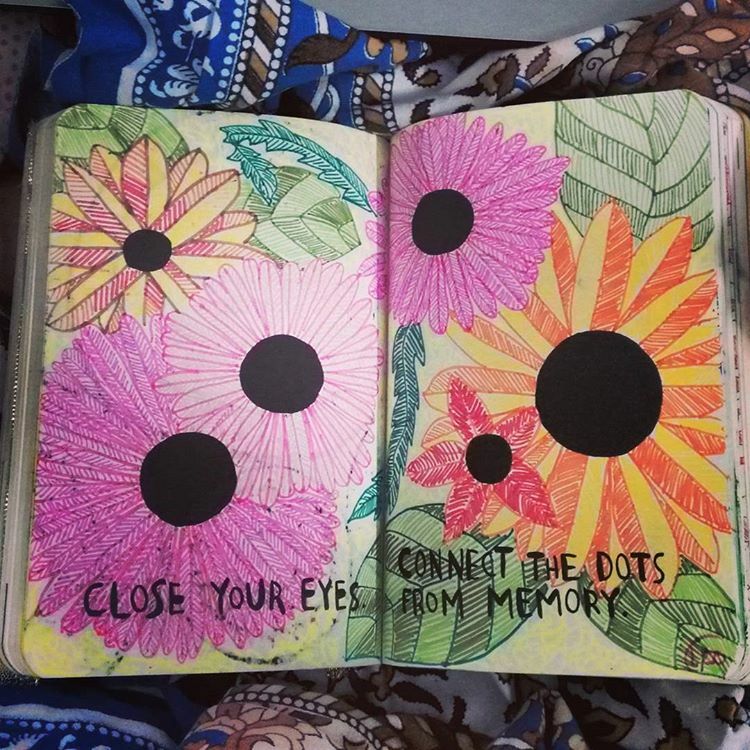 The fourth required me to connect the black circles from memory - I originally meant to draw sun flowers but these happened. I have been keeping a tortoisey pace - slow and steady - about twelve pages in three months. Nevertheless, the activities are incredibly relaxing, more so after a difficult day at work. 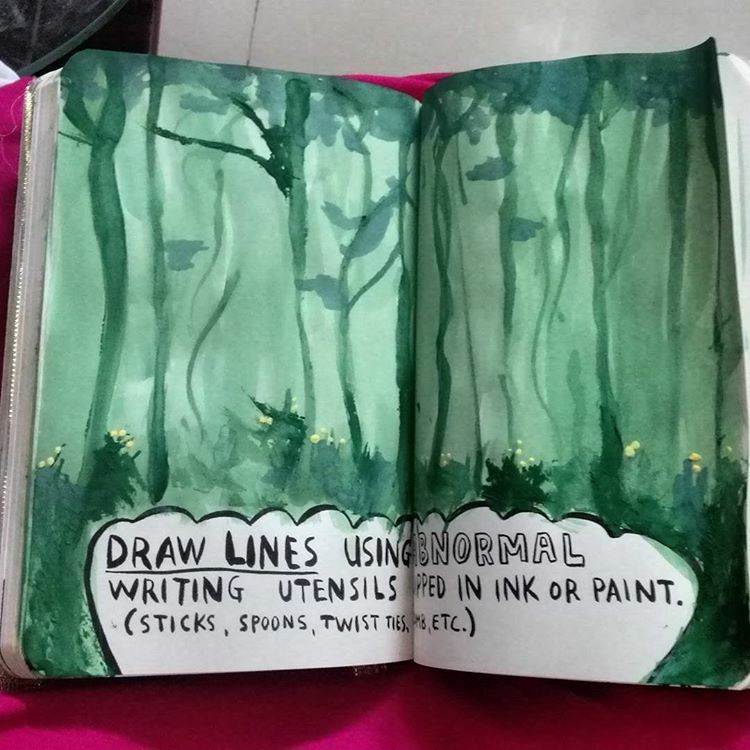 Keri Smith is not wrong, there is something specially liberating about colouring outside the lines, about spilling things, tearing up paper, cracking spines and dog-earing pages. I am quite finicky about the way one handles books. But over the past month I have found myself appreciating a good coffee stain, a pageful of notes in the margin, that sort of thing. 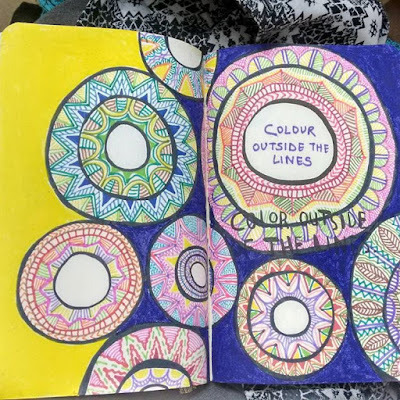 And with fifty prompts continually whirling around in my head, I feel I have started noticing things better, all around me - patterns, colours, ideas. The journal is a very personal thing, and this is hardly a review. But I am sharing it here because in the past a certain amount of accountability has done me a lot of good. I also made an Instagram page (whatever they are called) to share my progress with the Wreck This Journal. It turns out the Insta-world is filled with other Wreckers and it's a treasure to interact. I do hope you check out the page and buy yourself a Wreck This Journal as well. Meanwhile, any recommendations on books about creativity or exercises to keep the creative self alive will be greatly appreciated.